A building and development company approached us to help with a large storage unit that required insulated doors to help maintain a constant temperature within the new facility. They had approached other companies whom standard doors would not fiit into the designed steel apertures, however Worcester Doors Limited manufactures all of our own insulated industrial roller shutter doors and we can manufacture any door to suit any aperture, and with our ISO9000 accreditation our quality is assured. 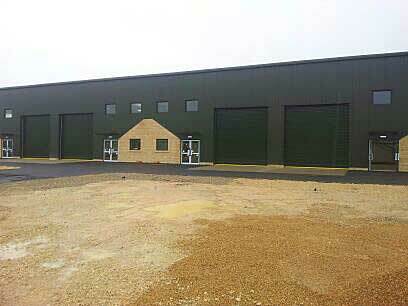 Each of the four doors was manufactured with a double skin wind load tested lath to class five resistance, having an external green finish to match the rest of the new portal frame steel building within Moreton in Marsh in the Cotswolds. Our design team worked closely with the steel frame manufacturers and the building development company to ensure the final product matched the structure and complemented the finished building. This attractive, aesthetically pleasing insulated roller shutter design makes the ideal solution for any modern architecture, whether industrial, commercial or retail environments. With a wide range of uses throughout most applications this high quality shutter door makes this a first choice for any structural opening and with todays architectural demands for aesthetics, reliability, performance and safety in use, insulated roller shutter doors minimise energy waste, both with heat ‘flow through’ and around the curtain. 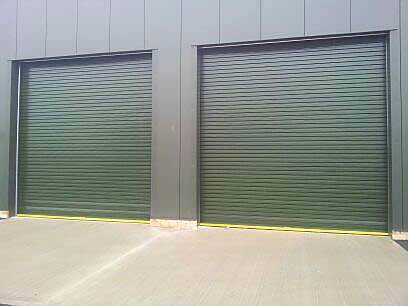 Insulated roller shutters are ideal for many applications where energy conservation, protection against the elements and vermin, extreme noise and a high level of security are vital, manufacturing, factories, warehousing, distribution, garages, grain storage and many many more applications. Our industrial insulated doors come complete with necessary floor seals and brush seals to further assist in its insulation properties and can be altered or modified to suit various applications and numerous on site conditions that can be encountered. Insulated roller shutters are ideal for many applications where energy conservation, protection against the elements and vermin, extreme noise and a high level of security are vital.